Robert Hirst, director of the Mark Twain Project, was interviewed on NPR’s Fresh Air on December 1. In the interview, Hirst shares some little-known pieces from the Autobiography, including a gem of a story in which Mark Twain meets and converses with Helen Keller. He also articulates why this version of the Autobiography is different from others, and why readers of past versions may have a distorted view of the book. Tirelessly making the radio rounds, Hirst gave two other standout interviews last month. While in Kansas City for a presentation on the book at the downtown Public Library, where he was introduced by the first lady of Missouri, Georganne Wheeler Nixon, he was interviewed by local news station Missourinet. In this interview with Baltimore’s Public Radio station, WYPR, Hirst shares the remarkable story of how the Mark Twain Papers ended up at UC Berkeley, instead of their intended home, Yale (yeah!). For a live perspective on the Autobiography, go to Moe’s Books in Berkeley on December 7 at 7:30 pm, where Benjamin Griffin, one of the editors at the Mark Twain Project, will be there to discuss the book and answer questions. We’ve heard reports that stores around the Bay Area are low in stock, but Moe’s will have plenty of books. 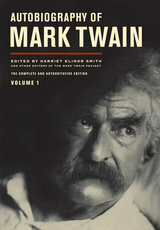 So don’t miss this event if you want a guaranteed copy of the Autobiography of Mark Twain in hand before the holidays.